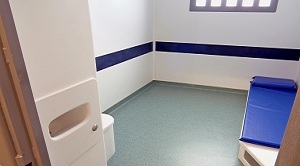 Correctional facility flooring, whether in cells, shower rooms, workshops, kitchens or common areas, gets put to the test. Floor coverings have to be highly durable, safe, easy to maintain, and sanitary—finding a flooring solution that does it all while sticking to your budget can seem like a challenge, but not with Florock. 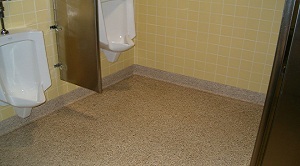 Our heavy duty correctional facility flooring makes the grade no matter your specific needs. We have the full-scale laboratory testing facilities to ensure that these high tech floors perform as required. Installed by experienced, approved specialty contractors, our concrete epoxy floor coating systems and more ensure long-lasting integrity. Safety is the number one priority at any detention facility, and your flooring must strictly comply. Our correctional flooring has customizable skid resistance that is well-balanced with floor cleanability, giving you both the safety you need and the convenience of easy maintenance. With optional antimicrobial protection and an integrated radial or canted cove base, these seamless concrete resurfacers offer germs few places to hide while supporting effective pathogen control. Mopping certain concrete sealers and hardeners makes them wear away quickly, while stained and polished concrete flooring requires regular re-waxing, polishing or buffing. In both cases, porous concrete surfaces can begin to absorb germs. Concrete dusting can become problematic, posing a threat to air filtration systems and even your inhabitants’ health. In contrast, our hard-wearing concrete epoxy floor coating systems and other resinous flooring solutions provide detention facilities with the heavy-duty, long-wearing finishes they need. Exceptional durability and easy maintenance with no waxing are the hallmarks of these correctional facility flooring formulations. Without the need for specialized, expensive care, these concrete coatings provide great life cycle cost and exceptional flooring value. We offer concrete floor coating systems for every correctional application and security level, including quick-curing and low-odor options.